It's 82 degrees outside with a slight breeze, and I just spent an afternoon relaxing with a cocktail on a restaurant patio. Summer is here, and this year summer means it's sci-fi time! Quite a looker, ain't it? I had the pleasure of reading Adam's copy, procured from a used bookstore. Hours of literary fun for the bargain price of $2.50! Ok, so maybe it's not the sexiest of books on the surface. It was published in 1959 and is the oldest of the 12 books on our list. Based on the cheesy cover art, I didn't have very high expectations. But I've said before and I'll say again, I love being proven wrong! 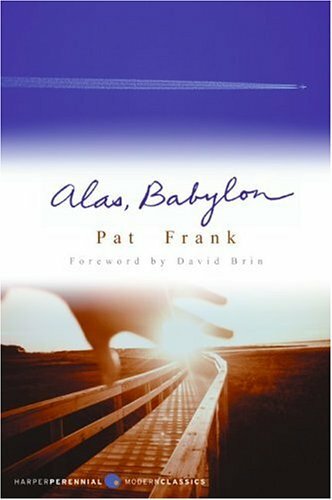 I had a great time reading Alas, Babylon, and I think it is the perfect place to begin our science fiction adventure. Here are the basics: Randy Bragg, a young single alpha male, lives in Fort Repose, Florida. His brother Mark, an Air Force colonel, sends him a telegram with a cryptic message that includes the phrase “Alas, Babylon,” a reference to the book of Revelation. From a conversation they had years earlier, Randy knows this is his brother's coded way of saying that a nuclear attack is coming, and he sets about preparing for an unprecedented war. It turns out Mark's dire prediction is exactly right, and what follows is the story of how Randy takes charge, first of his family and friends and eventually the whole town, and works to survive in a post-nuclear age. Everyone has to make adjustments as the electricity goes out and access to products like gasoline, coffee, liquor, and even salt becomes difficult or impossible. Spoiler alert: there's a lot of fishing involved. And if you've ever wondered if armadillos are edible, this book will answer that question. I didn't expect a story about people struggling to survive without modern conveniences to be compulsively readable, and I definitely didn't entertain high hopes about the quality of writing in an early science fiction novel. I was pleasantly surprised on both counts, as the plot hooked my interest and the writing quality secured it. Science fiction and other “genre fiction” get a bad rap sometimes; the widely-held perception is that plot-driven works tend to be marred by clunky prose. But this book is smoothly written, bordering on elegant. (It includes the most poetic and succinct suicide scene I've ever read.) Frank somehow manages to describe the weary drudgery of food scavenging and community organizing without making the reading of it a heinous bore. So here's your invitation to join the Summer of Sci-Fi party. If you're new to sci-fi and a little skeptical, Alas, Babylon is a good place to start. It's not overly technical and the writing is of decent quality. It's a fast read and the plot has plenty of impetus. Give it a try—maybe you'll love it so much you'll wonder what you were doing with your life before you discovered sci-fi. If you've read Alas, Babylon, I'd love to hear your thoughts! Leave a comment here, or on Facebook or Goodreads. Comments will stay open throughout the summer so you can join in the conversation anytime. And finally...Check out our Merch page to see our updated Shop! We've added some new items specifically for Summer of Sci-Fi, including a sweet green T-shirt. Rep your love for science fiction and RWH at the same time!